Who’s looking after the garden when you’re on holiday? For the maintenance of the garden and plants when you're away, consider the home-sitting! Caring for the garden and indoor plants is ideal work for a home-minder! Home-sitters contribute to daily upkeep of plants and gardens. The pleasure of going on holiday can be spoilt by the thought of what awaits you on return. Drooping pot plants, dried out planters and a lawn that looks like a burnt-out hayfield. It’s impossible to hire a gardener when you go away for a few days. And who’ll look after the swimming pool? Home-minders are just the people who can give your property all the basic care it needs, both indoors and out of doors, while you’re away. 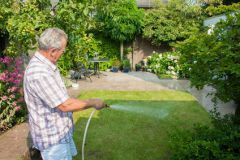 A house-sitter won’t replace a gardener! But all the simple and necessary tasks can be done with loving care. Home-minders stand in for home-owners in all the little things that really matter. The owner of a home that is properly minded can look forward to a splendidly cared-for garden on return. And visible signs of occupancy are a real deterrent to break-ins while you’re away!